My new Spectre arrived this week and I have been using successfully with my DevilBox. The setup was a bit weird, I had to keep uninstalling and reinstalling the thunderbolt and Nvidia drivers, then suddenly it worked. Currently I have only tested MGS Phantom Pain - I could run it at 4k 45fps on the internal screen - it looked pretty amazing. Thanks for your help! Downgrading did the trick. New picture attached. Doesn't seems to be as big of a difference that other experienced, but it's higher. I'll test it with real world fps games sometime during the week. As I understand from @4chip's comments, HP had a certain number of PCIe lanes to work with and the addition of the MX150 dGPU means the TB3 controller was wired with 2-lanes. So this is a 16Gbps-TB3 eGPU implementation. Thanks 🙂 Correct. I now have the Aorus Gaming Box 1080 and have similar results. 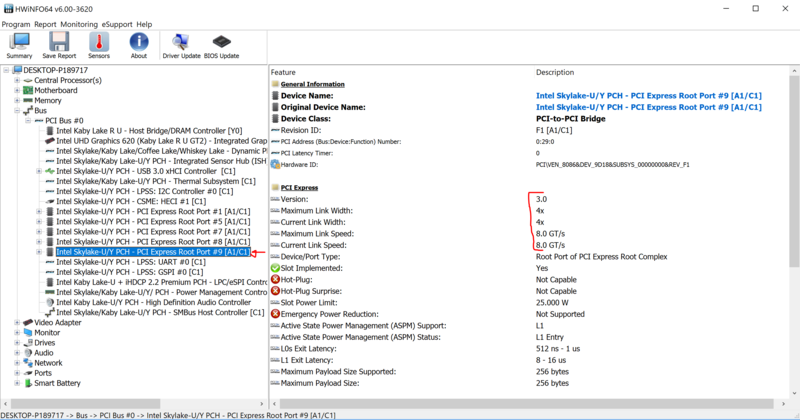 The Spectre X360 15" has 2 PCIe lanes for its Thunderbolt connection. *ALL* 15" x360 Spectres to date have 2 lanes on the TB3 port, as all 15" models have dGPUs. The difference GPU-wise is that earlier models have the built-in NVidia 940M(X) and the newer ones a MX150. The lane assignment has not changed. I don't expect this to change until Intel makes more PCIe lanes available for its U class processors (which hasn't changed across the Skylake/Kaby Lake/Kaby Lake Refresh). As this post is now a year old, could you confirm that the HP Spectre 15ch000xx models still have only 2 lanes? HWiNFO64 seems to suggest different but I could be looking at it wrong. That's the wrong port. Thunderbolt port should be Hot-Plug capable. That might be the nvme or dgpu.